I seem to do everything wrong. According to the top bloggers out there at least. I don’t post often or regularly, I write long(ish) meandering posts, they take awhile to get to the point (if there actually is a point) and I often digress (often in long brackets). I make a few grammatical and spelling errors (this isn’t a “slow blogging” thing, this is just my ineptitude and something I am working on improving), I don’t think of tags and keywords or search engines when I write my posts. But recently I wonder whether I have painted myself in a corner with this whole Slow Blogging ideology. We all (bloggers that is) write to be read, there is no point putting something out there otherwise is there? Saying that, I often get a terrible case of the “humbles”. With so many brilliant blogs, books and other resources out there covering slow, minimalism, mindfulness, frugality and associated fields what do I have to offer to the field that is of real value? I worry that I am not saying anything new and just regurgitating what has already been written elsewhere but in a duller and less coherent manner. Why would anyone want to read my (unoriginal?) take on the idea when there are so many more established (and brilliantly talented) voices out there saying it better, more succinctly, and (most importantly) more stylishly than I? 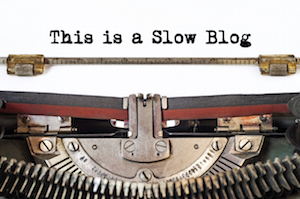 So, the important question is “is Slow Blogging working for me?” and am I really Slow Blogging or just blogging slowly (Slow Blogging is about applying the Slow Philosophy to the blogosphere, blogging slowly is, essentially, being lazy – and Slow certainly isn’t about being slothful or lazy)? Am I blogging in a way that is ineffective just because that is the way I feel I should, or ought to blog to fit into the ideology I have developed, therefore essentially “cutting my nose of to spite my face”? I have got into the habit of not posting too regularly as I think that is what Slow Blogging is all about. Which it isn’t. Slow Blogging isn’t actually about blogging less regularly, it is about blogging at your own pace and speed, rather than having that dictated to you by what you “should” be doing to have a “successful” (whatever that means?) blog. If you want to post 10 times a day, go for it, that is still as much of a Slow Blog as one which is updated once every 6 months. Why? One of the core tenants of the Slow Philosophy is Tempo Giusto, or finding your own rhythm in this hectic world. So by trying to stick to my own rules about Slow blogging, have I inadvertently broken all the rules of Slow Blogging? Who knows? I am still working on it, but right now, I am just going to blog when I want, rather than when I feel I should (which was my original intention anyway! Until I trapped myself in my own rules! ).